It occurs to me that some people who read this blog might not be aware of Diane Stuemer. She was an Ottawa woman who circumnavigated the globe from 1997 to 2001 with her husband and three young boys. What makes her story remarkable is that she had spent only six afternoons sailing on the Ottawa river prior to their trip. Her story provides inspiration to me. Our family is pursuing a similar dream yet I have no prior experience as a sailor. And, like me, Diane Stuemer was 43 years old when her family began their journey. Our family is taking our time to pursue our dreams. But, we haven’t had a brush with cancer as Diane Stuemer did. Still, her journey was not driven purely by a sense of mortality and a desire to grab life by the horns. One of her motivations was a desire to reconnect with her husband and their shared love of travel. And, this is something I can relate to. My husband and I met in 2001, and bicycled the US Pacific Coast in 2002 and 2003. Pursuing our passion for cycling (and each other) we got engaged while bicycling on the Golden Gate Bridge, and got married in 2004. This summer, our road trip across Canada and onto San Diego rekindled our joy of travel but this time we were a family with four young children. I liked living with what we needed most, and not packing our lives with unnecessary wants, which is what we do sometimes in maintaining our lifestyle with a house in the country. Likewise, Diane Stuemer left her suburban lifestyle to pursue her dreams. Throughout her trip she wrote weekly dispatches for the Ottawa Citizen newspaper. With a background in journalism, she documented her family’s journey around the world, which saw them sail 65,000 km and visit 34 countries (Ottawa Citizen, August 2014). Her weekly dispatches and subsequent best-selling book, “The Voyage of the Northern Magic: A Family Odyssey,” captured the hearts and imagination of many people. Sadly, Diane Stuemer succumbed to cancer in 2003. I would have very much liked to have met her. From her book, I gather she had a funny sense of humour, and was a partner through-and-through with her husband. In the early days of their trip, Diane described unrelenting sea sickness. Later, she describes weathering a storm near Australia with nail-biting intensity. She later learned that four other sailors had died in the same storm. Her writing is interesting because it marks the world at a different time, pre-September 11, 2001. Diane Stuemer took her dingy to photograph the USS Cole after it had been bombed in Yemen. The pictures she took were distributed by the Associated Press (AP). In describing our plans to people in Ottawa, I have met someone whose children went to school with the Stuemer kids, as well as parents who benefited from talks she gave at local homeschooling conferences. But, the way she touched people’s lives didn’t end at the local level. She raised awareness about an orangutan rehabilitation project in Borneo. And, she and her husband created the Northern Magic Foundation to help support a school in Kilifi, Kenya. The foundation “now supports 117 high school students and one university student.” (Ottawa Citizen, August 2014). Dr. George Ouma came to Ottawa this summer to visit Herbert Stuemer. Now a medical doctor, Dr. George Ouma benefited from the Northern Magic Foundation, and the generosity of its donors. Her story and the way she told it was so delightful and compelling, it was impossible not to [get attached to her story]. And the way she painted her family, warts and all, allowed you to see how they changed and grew as human beings — well, it was impossible not to get drawn in. 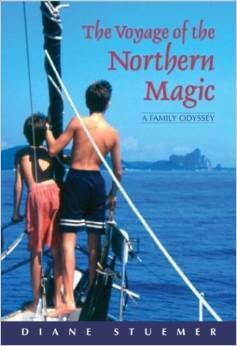 If you haven’t read the book, “The Voyage of the Northern Magic: A Family Odyssey,” you might consider picking up a copy or borrowing one from your local library. Previous Where to anchor at Namely Harbour? Next Caribbean has no tides! A good book … thanks for bringing it to the attention of all those who hadn’t heard of it. Here are a few more titles published by Canadian cruising families. I hope you will like them! (4) Andrew W. Gunson, “Voyage of the Maiatla with the Naked Canadian” by Andrew W. Gunson (2004). Sequel: “The Tahiti Syndrome, Hawaiian Style” (2012).